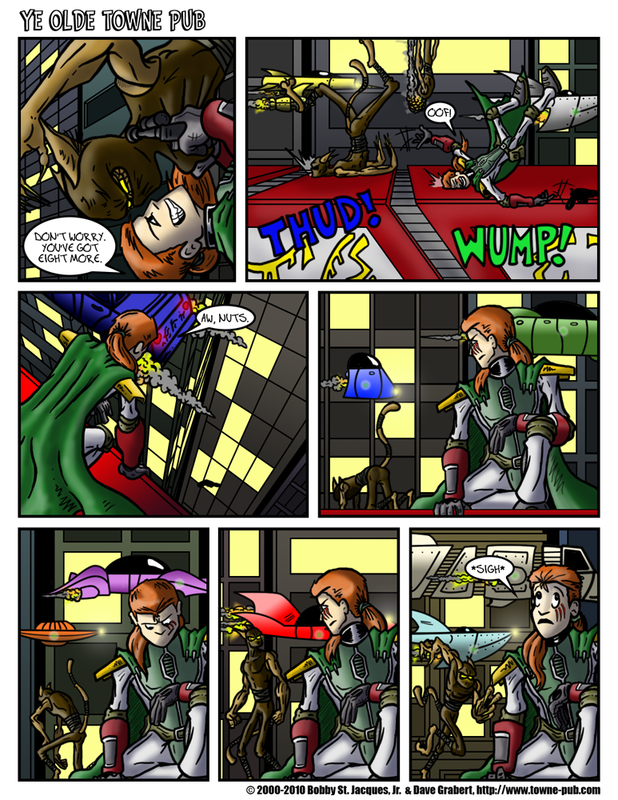 Page 3 of Reboot to the Head! Dave and I have spent a lot of time talking about how we create strips, both in blog posts here on the front page and Dave’s excellent (and very detailed) behind the scenes article. Over time I think we’ll flesh that article out to include chapters on each stage of the process, along with detailed examples from several strips, but if you haven’t already read through it, and you’re curious at all about the process that we undertake when creating a strip, please check it out. Today’s strip is a very interesting one, for me. I was extremely proud of the first two strips. I’ve got the 3rd panel from page one as my desktop wallpaper (on both monitors), and the splash page for page two is one of my favorite things that I have ever drawn. But this strip was incredibly painful to work on. It was slow to write; where the first two pages popped into my head all at once, writing the action in this third one was like pulling feef. But rather than go into nitty gritty detail about the strip, even though it’s tempting, I thought I’d share a little snippet of why it’s so fun to work together with Dave. Many times when I hand off a black and white strip to Dave, it can be very confusing for him to decide which little squiggly lines belong to which part of which character. He makes a best guess, and usually gets it about 95% correct, but sometimes he misinterprets what I meant in the art. It’s totally understandable, especially when we have so many overlapping, transparent layers in each panel. In some cases the coloring missteps even make it past me, and end up published on the site (we later correct them once we find them). 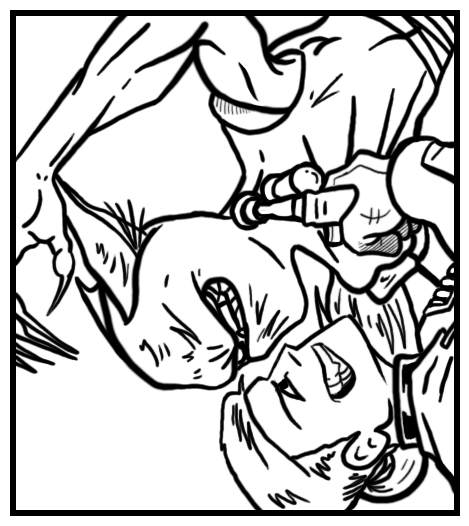 When I drew the first panel of this page, I was concerned that Dave might have a hard time figuring out which bits were Phinn, and which were the cat alien, especially around Phinn’s left hand. Confusing Inks (click for larger). Handy dandy color guide (click for larger).